The Bomber Command Stations and Bases relied heavily on WAAF MT drivers, the training they were given allowed the WAAF Drivers to be used for a range of driver duties. Although some would be permanently assigned as drivers for senior officers most others faced each new day waiting to see what duty was assigned to them that day. Some duties could be quite odorous, garbage pickup was one but maybe the worst was on bases were spill buckets were still in use, loading and driving around with these toilet buckets was one duty to avoid. They also drove the small tractors from the bomb dumps to the aircraft in long lines of dollies, then were relied on to move the the bombs under the bomb doors, all without damage to the aircraft. It may have been the freedom of being able to travel around the bases, picking up and delivering items to different sections spread around the base that enabled the MT drivers to get to know more of the base personnel then the other WAAF trades whose duties kept them within a regulated area. 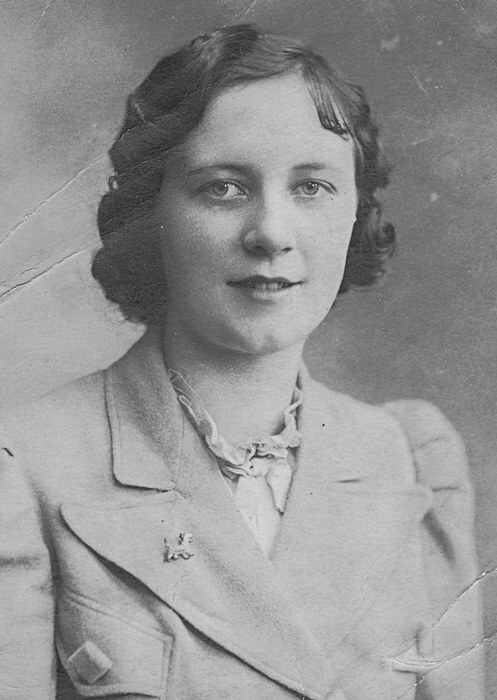 For WAAF Dorothy Ward the night of April 14th 1942 was an event she never forgot, and one she wrote down of her experiences of that night. Wellington X3484 was a last minute addition to a solo the operation to LeHavre, all the other of the squadrons Wellingtons were going to Dortmund. The crew was one put together of men that were on the base, but not a crew as such, for a pilot, F/S Norris was brought back from the main gates of Mildenhall were he and F/S Barbour were awaiting a taxi to take them to town. Both pilots had their Leaves cancelled and ordered to take VR-O on the nights operation to LeHavre. No mention is made of why this lone Wellington was sent to this destination. WAAF Ward was the driver who took the crew out to their aircraft's dispersal pad where X3484 was waiting for them. Ward remembers that the Wellington had not been flight tested prior to this night's Sortie. At the designated time Ward drove out to VR-O's pad to await their return, time past without a sign of VR-O. Then she saw balls of light appearing and commencing to fly randomly around the expected aircraft's dispersal area. The balls of light came very close to her and in fact she had to duck a time or two to avoid them. As they passed she could hear an electrical type crackling. Then they disappeared as fast as they had shown up. At this point she new VR-O was never returning. It's not an unusual story, but still a rare one, of things happening in some form or other signalling disaster to those left behind. For WAAF Dorothy Ward and her friend June taking rides during flight tests was a welcome diversion, in her notes she mentions a list of eleven test flights she was on. Test flights were something that normally the crew and maintenance crews took part in, but in these early days others went along for the ride, sometimes for the thrill, sometimes to cool off the beer. After the incident on June 6th 1942 at Mildenhall with Wellington X3556 things became serious. For Ward and her friend June it would be the second trip with pilot F/S Pearson, then they were asked to give up their seats to let some others go up. So June and Dorothy stood down for three Americans attached to the base to join the test flight. USAAF PVCs Rudd, Baral and Nelson were on board along with two RAF ground crew LAC Patmore and Cpl. Denyer. F/S Pearson's crew were also on board. In total ten people were on board when one of the engines quit and the pilot was making a forced landing. The Wellington hit a fence in the field, flipped over and caught fire. Only two survived. "Herbert Mobbs, farmworker at Catworth, employed by Mr. H. Pashler saw the Wellington come down in lodge field in the direction of the top of bridle road on the West side of Brook House Farm where it began to burn. So said Herbert Mobbs at the inquest held at 17:30 hours, Tuesday July 7th 1942. Lionel Abrahams was the Corner, Wing Commander John Fulton of 419 Squadron was present as were Nursing Orderlies Sidney Harris and George Hutchings, RAF men from Molesworth Aerodrome two and a half miles from whereX3556 came to rest. The RAF Nursing Orderlies saw two airmen Parnell and Nelson wandering about the field badly cut and burned.